We love our customers and love your creativity. Here behind the scenes, we get a glimpse into your homes and your styles and wanted a way to say "Thank You" and inspire that creativity even more. So we're doing something new and we're SO excited about it: starting this month, we're including a FREE gift with every order. Wahoooo!! This month, apropos of the season (and our own gratitude to you who keep the lights on), we'll be including this super sweet "Thankful" decal in every order. And to get your ideas flowing, we've put together some great, simple ideas on how to use it around your home. First up, and pictured above, I've got this lovely wood-grain charger plate (thank you Michael's 70% off sale) that was begging for something to spice it up! I added our sweet Thankful decal (this one is in Gold) and some floral and pumpkin extras I had on hand. 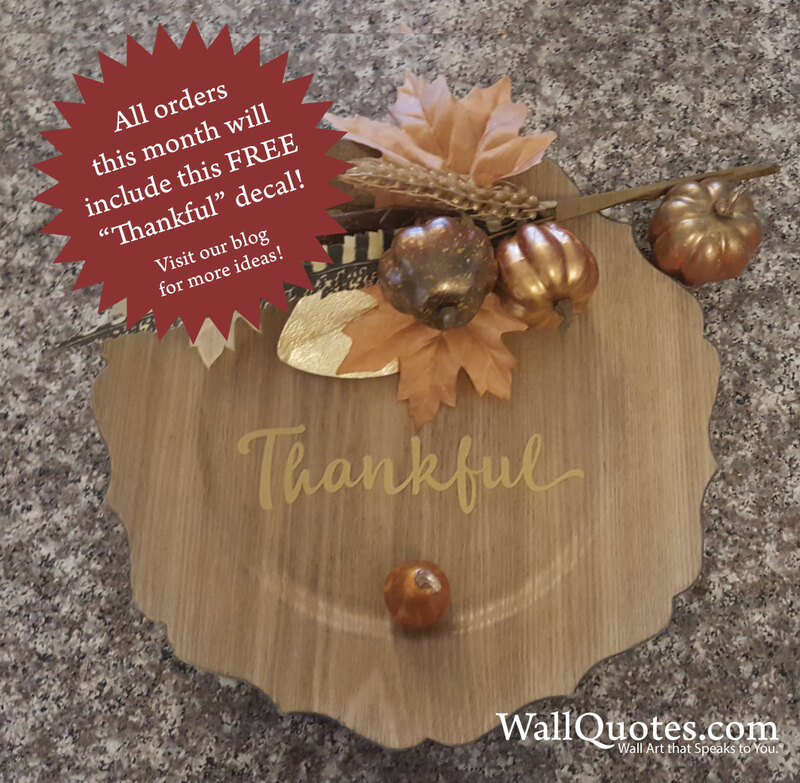 I think this will be the perfect accent to my Thanksgiving table this year! Then, I thought about where else I could use a reminder to be Thankful? The bathroom! We are all in there multiples times a day, first thing in the morning and last thing before bedtime. What a great place to think about all the things we have to be thankful for! If I were as grateful as often as I wash my hands and brush my teeth, it'd be a very good thing.Of course, there are lots of little places where a reminder to be Thankful will work well. Raelene's planning to put hers on her refrigerator (stay tuned for that post in a couple days). And really, this reminder is a good one year-round (amiright?). 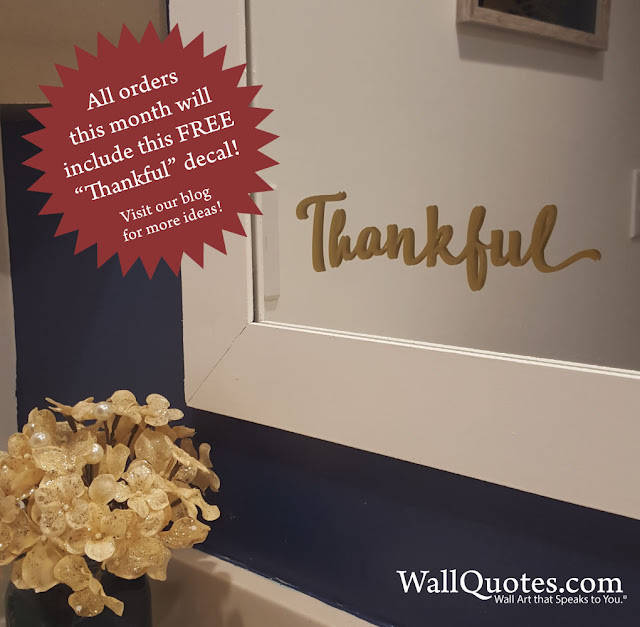 So, look for more ideas coming up this week, watch for your very own "Thankful" decal in your next package, and share with us how you're using it! Use #WQinspired on social media (we're on Instagram @wallquotes and Facebook @belvederedesigns) and we'll be featuring some of our favorites all month long!